Pork tenderloin is ideal for quick cooking. 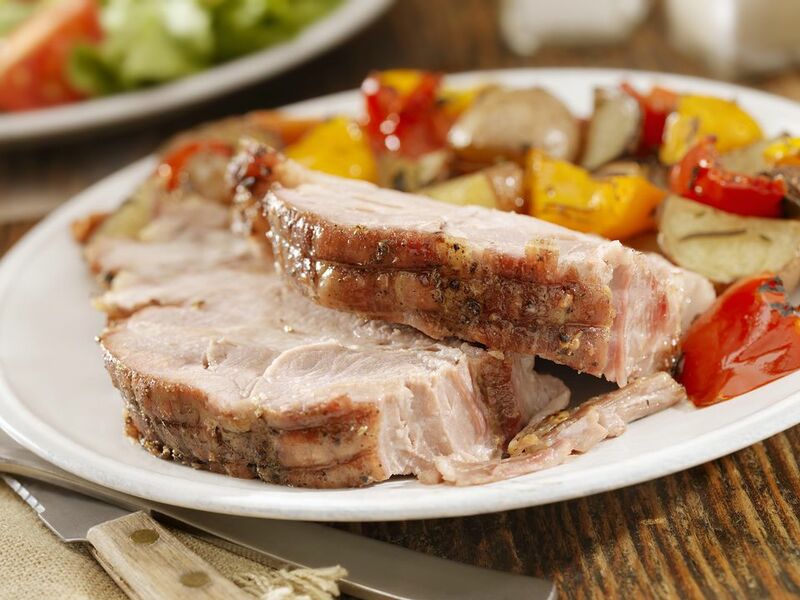 This most tender and flavorful cut of pork is very lean. There's no waste either, since the tenderloins are trimmed before you buy them. Because the cut is so lean, tenderloin should be cooked quickly. If you cut a tenderloin into rounds or medallions, it will cook in minutes on a dual-contact indoor grill. Each tenderloin usually weighs about 1 to 1-1/4 pounds. Pork is cooked in minutes per pound. So roast a tenderloin at 425 degrees F for 15-20 minutes per pound and grill it over medium coals for 15-25 minutes per pound. The internal temperature should be a minimum of 145 degrees F (the USDA lowered the safe temperature for pork in the summer of 2011). It can be difficult to find this cut of pork in the supermarket, so you may have to order it from the butcher. When you do find it, buy lots of it and freeze it to use in these wonderful recipes. One of the quickest meals in the market starts with a marinated pork tenderloin. Several companies produce this product. Just cook and eat! But you can save some money and control sodium by marinating a plain tenderloin yourself. Enjoy these quick and easy recipes with the quick-cooking cut of pork. Once you've mastered this recipe, you can flavor the tenderloin any way you want, from Ranch salad dressing or Italian herbs, to Chinese five spice powder and hoisin sauce. This special and elegant recipe is perfect for entertaining, but it's so easy to make! Another five ingredient wonder; this time roasted with sweet and tender root vegetables. You know how I love mustard! It's fabulous paired with tender pork in this easy and elegant recipe. A simple marinade of lemon juice, oil, garlic, and thyme perfumes this wonderful and very tender tenderloin recipe. Onion, chili sauce, and orange marmalade make a delicious glaze on pork tenderloin and snow peas. Cutting pork into medallions means they cook quickly and are super tender. This easy recipe is delicious. I don't eat veal because of social concerns, so this recipe is perfect for me. Pork tenderloins slices are coated with crunchy bread crumbs and sauteed to a crisp finish.